Are language and consciousness co-evolving? Can psychedelic experience cast light on this topic? Xenolinguistics documents Diana Reed Slattery's eleven-year adventure of psychonautic exploration and scholarly research, focusing on her understanding of Glide, a symbolic language system she acquired in an altered state of consciousness. What began as a deeply personal search led to the discovery of others, dubbed xenolinguists, with their own linguistic ideas about language from the psychedelic sphere. From scientific papers to the individual trip reports on the Vaults of Erowid and the life work of Terence McKenna, Alexander and Ann Shulgin, and Stanislov Grof, Slattery shows us how we are converging on new knowledge of the mind and how to shift its functioning for therapeutic, spiritual, problem-solving, artistic, and/or recreational purposes. Weaving together a wide range of scientific, artistic, and experiential voices, Diana Reed Slattery plunges into one of the outstanding enigmas of psychedelia: the place of language. Picking up where Terence McKenna left off, she probes the altered states of language, from shamanic eloquence to 'downloaded' symbols to the Other's alien speech. Bringing extraordinary experiences into sparkling dialogue with critical theoretical issues, Slattery has created a marvelous and insightful exemplar of psychonautics in the 21st century. 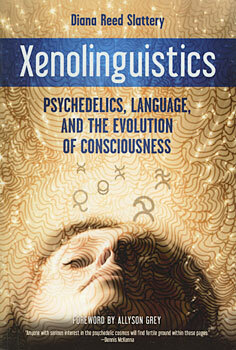 In Xenolinguistics: Psychedelics, Language, and the Evolution of Consciousness, Diana Reed Slattery provides an intriguing and far-reaching non-fictional investigation of the linguistic and symbolic constructions of alien languages, such as the visual language Glide on which she based her fascinating novel, The Maze Game. Combining first-hand experience, accounts from other 'psychonauts' who use psychedelics to explore unknown territories in altered states of consciousness, and scientific research on the entwinement of language and consciousness, Slattery's book is highly synthetic and provocative, an exhilarating voyage into what it means to encounter the linguistic alien within and without the self. Slattery's courageous immersion into expanded consciousness for the purpose of knowledge creation is part of an exciting new era of exploration and discovery that will continue to inspire future generations of researchers.